Webb rides better when he's confident. His move to 450 coinciding with his fall at the 2016 Des Nations had him questioning his abilities. He's going to get faster if he stays healthy, that should worry just about every other rider in the world except Jeffrey Herlings who I think is on a different level outdoors. SX series should definitely be fun to watch for the remainder of the season. Webb is killing it. I never expected him to round up Marvin last race, and he pulled a 5+ sec gap to smack rozcen on the line. Again. Lad's coming into his own again. Next multi title holder. Arlington was a good round, and I was there!!! A1 is 2 days away, it seems like it has been forever since the MotoGP season ended, can't wait to see 2-wheel racing again this weekend. 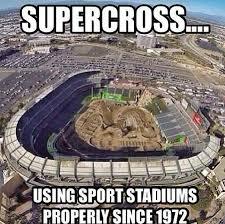 I'm sorry but I know FA about supercross. Dirt bikes. In stadiums on custom built tracks. Just like motocross, which I'm sure you would know of. We have something similar I forget the name, last time I heard about it they had one at Wembley Arena. Same same. But bigger jumps, larger track footprints. I think I'll try and find out a bit more, looks exciting (if you're young enough to ride LOL). Webb showing he's the big dog in the red bull KTM team.